The Samsung M3820DW is a fairly basic device. It does what it does to the expected levels and doesn’t falter. However, at the same time, this device doesn’t really stand out in anything either. Whichever feature you use on this machine, you can expect it to straddle the wall of mediocrity square in the middle. 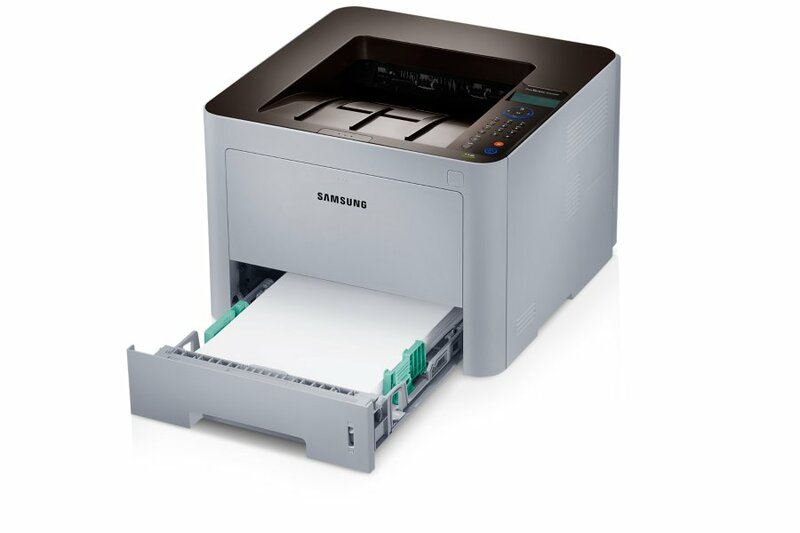 The Samsung M3820DW is, essentially, a monochrome laser printer that is best suited for micro to small scale businesses that have low to medium print volume needs. At the same time, this machine is scalable. For example, a business can go from low to medium print volume needs to relatively higher levels by choosing optional components and using the print engine’s inherent capacity. Further, the device comes with a bevvy of features that will help business owners get a better control over their business’s printing costs. Here’s our review. The reason why scalability with the Samsung M3820DW shouldn’t be a problem for all but the fastest growing businesses is the paper capacity of this device. The standard version of the M3820DW comes with a total paper capacity of 300 sheets which can be divided between a 250-sheet paper tray and a 50-sheet multipurpose tray. These 300 sheets should be more than enough for most micro to small-scale businesses but if your business grows at a fast clip in the future, you’ll be able to take this printer’s paper capacity to 770 sheets in a jiffy. This is made possible with a 520-sheet add-on paper tray. The print speed and the monthly duty cycle of the Samsung M3820DW complement its paper capacity. The device is rated to print at 38 pages per minute (ppm) while its monthly duty cycle rating is 80,000 pages. Apart from focusing on making its printer scalable for growing businesses, the Original Equipment Manufacturer (OEM) has also incorporated some very useful modern day features in the device. The foremost of these is wireless connectivity feature and Wi-Fi Direct. Wireless connectivity means that the printer can be connected to your office’s network directly while Wi-Fi Direct means that you’ll be able to print stuff off your mobile devices. 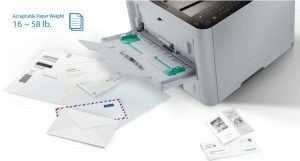 Apart from connecting to the printer wirelessly, you can use conventional methods such as USB 2.0 and Ethernet also. Further, the Samsung M3820DW supports mobile functionality by being compatible with Google Cloud Print, Air Print, and Samsung Mobile Print. Moreover, automatic duplexing feature, which will allow users to print double sided, has also been included in the device’s repertoire of features. 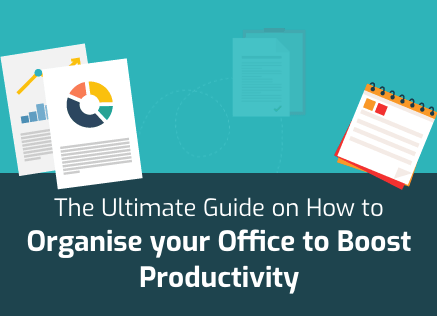 The reason why this feature is beneficial is that it can help with cost cutting endeavours since the business will save money on paper supplies. The primary weakness of the Samsung M3820DW is something that most low budget monochrome laser printers owners have to contend with i.e. less than excellent print quality. While this device is rated for a maximum print resolution of 1200 x 1200 dots per inch (dpi) and employs the Rendering Engine for Clean Page (ReCP) technology, the output quality is nowhere comparable to higher end devices. In practice, you can expect the M3820DW to deliver average print output quality. This means that text quality will be more than sufficient for professional use while graphics and image quality should only be considered for internal office use. The cost of ownership is also something that potential buyers should consider even though it shouldn’t be a major governing factor in their decision-making process. 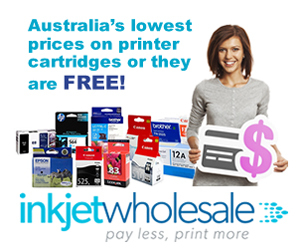 The Samsung M3820DW will cost a business about 3.03 cents per page if the business was to use genuine cartridges manufactured by the OEM. However, the same business would have the option to save about 1 cent every page, if it was to start using generic cartridges. Per-page cost with generic cartridges for this printer is in the range of 2 cents. What these estimates don’t consider is the numerous cost-saving features that the Samsung M3820DW possesses. For instance, this device has a Toner Save mode that allows the users to automatically skip blank pages. The printer also comes with the Easy ECO Driver software programme. What this software programme does is that it gives users the option of removing bold text from the document being printed, converting images to sketch from bitmap format and even removing them altogether amongst many other similar features. All these features combined can save the user 20 percent on toner if OEM claims are to be believed. 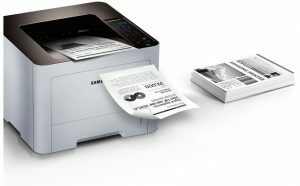 For the kind of paper capacity and features that the Samsung M3820DW providers, it is a fairly compact device. Its width and height are the same at around 365mm while its height is lesser at 261.5mm. These dimensions give the Samsung M3820DW a big footprint but they still don’t prevent it from being kept on a desk. The weight of the device will give you pause. The M3820DW weighs 12.2 Kg which means that you should ensure a sturdy desk at work and maybe even two people to place the device on it. The processing speed of the Samsung M3820DW isn’t all that bad especially if you choose to increase the standard memory. The standard variant of this device comes with 128MB of memory but you can take this up to 512MB if you so wish. We don’t have to tell the techy in you that 512MB of memory performs a lot better with the Cortex™ A5 core processor. What all this computing power does is that it gives you a first print out time of fewer than 6.5 seconds. Surprisingly, the Samsung M3820DW offers some security features too. It does so with the help of the Samsung SyncThru™ Admin Job Accounting Feature. The SyncThru™ Admin is a central print usage control module that gives you enterprise-level security options. This Admin can be used to segregate your workforce into various groups and even monitor their usage or put controls on it. The control panel on the Samsung M3820DW sports a simple 2-line LCD screen that should be enough to give you an update on what the machine is handling at any given moment. The SyncThru™ Admin, though, will give you greater control.